In the middle ages, walking the Latin Quarter would not have expended many calories. The Latin Quarter consisted of the area immediately surrounding the Sorbonne. 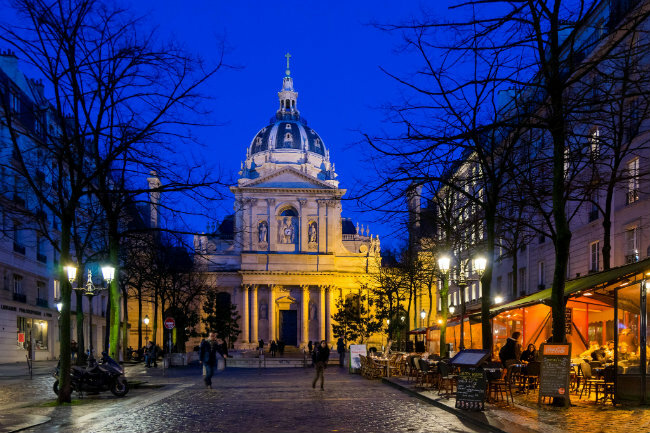 La Sorbonne was a theology college created by Robert de Sorbonne in 1235. 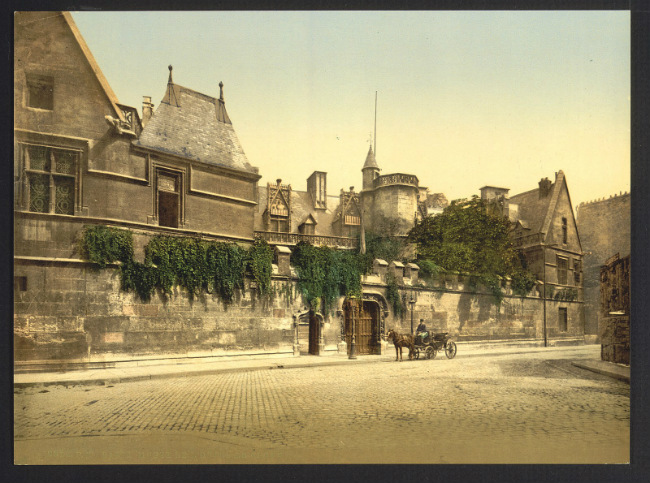 It is the oldest university in France, and even today, probably the most famous. Then it specialized in science and literature and only Latin was spoken, giving the area its name and adding to its reputation as the most historical area of Paris. It was in 52 BC that the Romans conquered the Gauls and built the city of Lutetia. As the city expanded, roads and arenas were built. The present day Rue Saint Jacques was the main paved street (cardio maximus), leading from the Seine to the Forum at the top of Sainte Genevieve hill. (Other original streets, now modernized, include Blvd Saint-Michel, Rue Galand and Rue Mouffetard.) In the year 310, the name of the city was changed from Civitas Parisiorum to Paris. The legendary Place Saint Michel, just a few paces from the Seine, is just as good a place to start our walk as any. 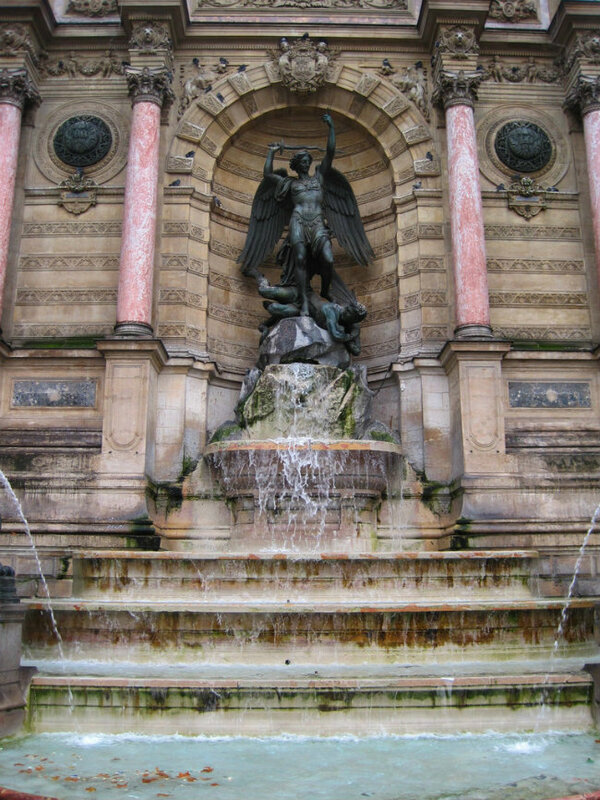 With its baroque fountain featuring Saint Michel killing a demon, it has remained the favorite spot for student demonstrations, (seemingly every weekend!) It was a rallying place for the resistance during the Nazi occupation of France in WWII and the student protests of 1968. To the left of Place Saint Michel, stumble up the narrow, cobbled streets of Rue de la Huchette, bustling with cheap restaurants, kebab shops and Turkish pastry establishments. This area, including Rue de la Harpe, is much maligned as too touristy and known, often condescendingly, as ‘Little Athens’, but for students and those on a budget, the vibrancy of these streets will always have their own, special charm. Indeed Rue de la Huchette boasts both the Theatre de la Huchette and the Caveau de la Huchette, formerly a 16th century wine cellar but since 1949, the go-to Jazz Club. The narrowest street in Paris, the rue du Chat-qui-Pêche is only 1m80 (5’11) wide and runs for 29m (95’) adjacent to 14 Rue de la Huchette down to the Seine. The walls appear to lean in on themselves like a protective stone umbrella, the daylight at the Seine, a welcome sight. At the end of Rue de la Huchette cross over Rue Saint Jacques onto Rue de la Bucherie, with the famed bookshop, Shakespeare and Company which not only faces the Seine but also has a great view of Notre Dame Cathedral. The Square René-Viviani next to Shakespeare and Company is a great place for taking your coffee, sandwich and book, if only to gaze at Notre Dame in a peaceful setting. Other churches of interest, Saint Severin in rue Saint Severin and Saint Julien le Pauvre in the rue Galande, have their own fascinating histories and are well worth a visit if old churches are your thing. Cluny Museum, Paris, France. Between 1890-1900. Photochrom Print Collection. Library of Congress. Public Domain. Continuing up the Boul‘Mich, cross over Boulevard Saint Germain and here at the intersection is the Musée de Cluny, a must for anyone interested in medieval architecture, artifacts, tapestries and jewelry. The Roman baths can be seen from the street and there is even a medieval garden where you can sit and take a break. The building was formerly begun by the Abbots of Cluny in 1334 and was rebuilt between 1485 and 1510. One if its most famous occupants was Mary Tudor. 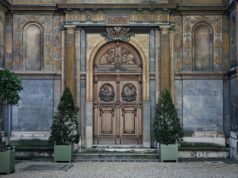 However it was in 1843 that an amateur collector, Alexandre Du Sommerard, moved into an apartment on the first floor of the Hôtel des abbés de Cluny. On his death, Du Sommerard’s collection of medieval artifacts was bought by the state as well as the building it was housed in. The Gallo-Roman thermal baths of Lutetia, dating from the late first century, have huge architectural significance. Over the last two centuries, numerous legacies and purchases, including the Lady and the Unicorn tapestry, amount to some 24,000 works on display covering the Roman Empire, early Middle Ages, the Romanesque era and the Gothic. Just past the Sorbonne, up the Rue Soufflot, is perhaps my own, personal, favorite building: the Panthéon. 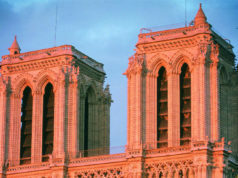 Impossible to miss, it dominates the skyline and now that the exterior has been restored, is more arresting than ever. 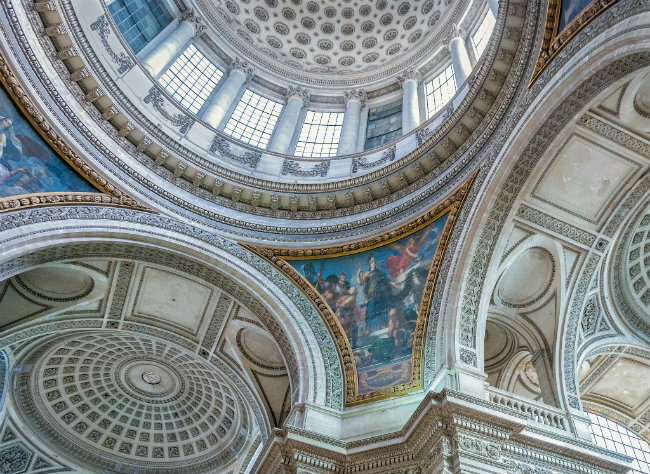 A basilica was commissioned on the site in 507 AD by King Clovis to house the tomb of Clothilde his Queen and himself, but it was not until 1755 that the transformation of the simple basilica was put into the hands of the architect Soufflot under the instructions of Louis XV. The Panthéon was completed in 1790 and turned into a national building in 1791. 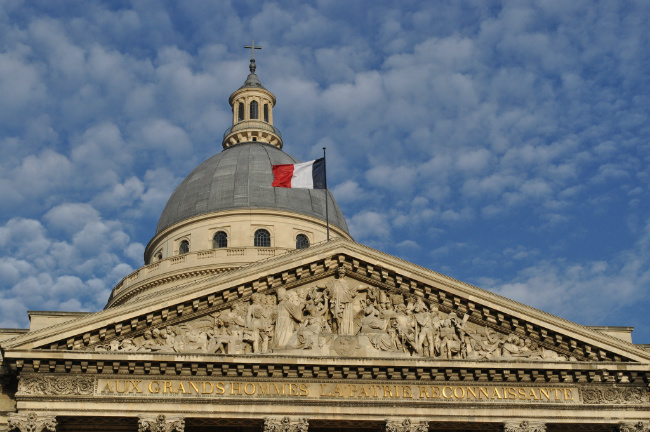 Until almost the end of the 19th century, the Panthéon was used for Christian worship but in 1885, the building was given over to secular use at Victor Hugo’s funeral. Before moving on to the right side of the Panthéon and the Rue Clothilde in front of the Lycée Henry IV, it would be a scandal not to continue a little further up Boulevard Saint Michel to the Luxembourg Gardens. These acres of beautiful gardens– comprising walkways, boating pond, tennis courts, donkey rides and the gorgeous, intimate, Musée du Luxembourg– deserve a morning or an afternoon for themselves, so you have been warned: stop off at your peril; you may never leave. Back at the Panthéon, bear right at the end of Rue Clothilde onto the Rue de L’Estrapade, a lovely open street with inviting little bistros. The Rue de L’Estrapade runs gently down into the much written about Place de la Contrescarpe. As with this entire walk, there is a choice of which little street intrigues you the most; going off at a tangent and simply following your nose is to be recommended at all times, there will always be a little gem to satisfy and pique your interest whichever direction you choose. Off the Place de la Contrescarpe, a lively square filled with cafés, the Rue Cardinale Lemoine, Hemingway’s first home in Paris, runs steeply downhill. The Rue Lacépède runs into Rue Geoffroy Saint Hilaire, a more straightforward route to La Grande Mosquée and the Jardins des Plantes. But of course we are meandering and the famous Rue Mouffetard to the right– with its even more famous market– can not be missed. At the top of Rue Mouffetard, on the right is the narrow little street, the Rue Pot du Fer, where George Orwell lived while writing Down and Out in London and Paris. A hundred years ago, this area was one of the poorest in Paris with the buildings little more than slums and the Place de la Contrescarpe, a drunkard’s paradise. It’s now a bustling market with bread and cheese shops that Parisians (and tourists) queue for. Not to mention the small restaurants of every ethnic persuasion… Time for lunch? And now I need to make a confession. From the bottom of Rue Mouffetard to La Grande Mosquée de Paris, I have never taken the same route twice. With no sat nav on my phone, my sense of direction has been known to abandon me and I have resorted to asking the way from any passer-by. As it is only a five minute walk anyway, lost or not, it isn’t really the end of the world, even if in my frustration it might seem like it… Anyway, here goes and please feel free to find an easier route! The 28 acres of the Jardin des Plantes make it the main botanical garden in France. Its origins were the Royal Garden of Medicinal Plants way back in the 17th century. Since 1993, the gardens, buildings, libraries, greenhouses and zoo have been classified as Historic Monuments. As suggested by its name, the Jardin des Plantes houses a botanical school training botanists. The other buildings compose of the grand Gallery of Evolution, the Gallery of Paleontology and Anatomy and the Gallery of Botany. The Alpine Garden, Mexican and Australian hothouses, and the Rose Garden contain thousands of plants. The stunning glass and steel hothouse was designed by Charles Rohault de Fleury in 1834. A walk through the gardens, especially in late spring, is highly recommended– the gardens a peaceful refuge for Parisians at weekends. At the end of the gardens you are greeted by the ever welcome Seine and the Quai Saint Bernard, now a waterfront promenade. Follow the quay left, past the outdoor sculpture museum and if you are lucky on a summer evening, the dancers who turn the quay into a tango dance floor. The Institut du Monde Arabe is impossible to miss. A monolith of a building, extreme in its modernity, sits where the Quai Saint Bernard ends. Established in 1980 and designed by the architect Jean Nouvel, its south façade reinterprets traditional Arab architecture in a bold, uncompromising way. 30,000 light sensitive, metallic diaphragms were designed to regulate the penetration of light into the building; the entire facade glitters shockingly silver in the sun. 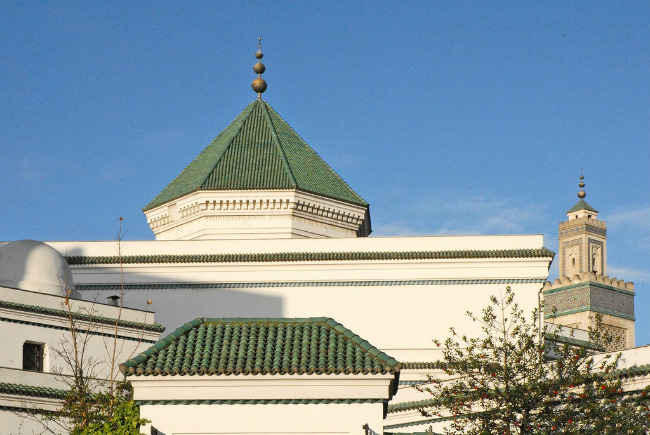 The institute contains 600 aspects of Arab Islamic art on three floors. These artifacts range from the pre-Muslim period to the Ottoman Empire to contemporary Arabic art and include ancient manuscripts, silk carpets, pottery, jewelry and astronomical instruments. Staying on the banks of the Seine and now walking along the Quai de Tournelle, lined with beautiful old houses and the best view of the chevet of Notre Dame, you can note no 15, where La Tour d’Argent was established in 1582. The river is busy with all types of traffic: industrial barges, open topped tourist boats and river police, the quayside full of walkers, the banks replete with restaurants and always in front of you, Notre Dame, the most beautiful woman in the world. Quai Montebello joins seamlessly from the Quai de Tournelle and stretches from Le Petit Pont to the pont de l’Archevêché and the end of our journey. The pretty Pont au Double, used only by pedestrians and cyclists, leads to Ile de la Cité, but stop for a moment halfway across for the perfect photo of Notre Dame. Back on the Quai it isn’t far to return to our starting point at the bottom of Boulevard Saint Michel. This is only one suggestion for a walk around the Latin Quarter, not attempting to uncover *all* the myriad little streets, mention all the wonderful, independent cinemas, or unearth all the history of the area. I’ll leave all that to you. Bonne promenade! 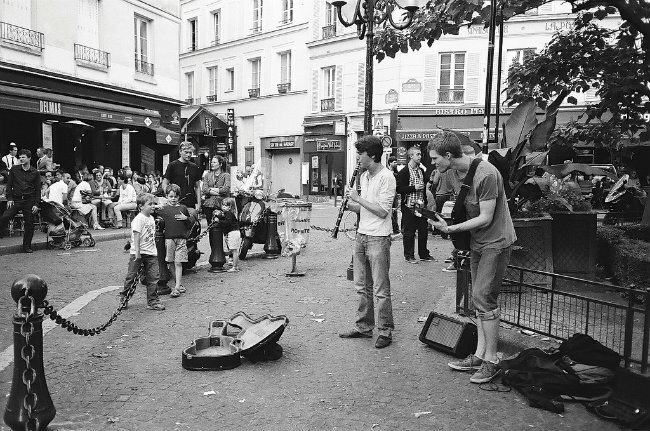 On my last visit to Paris, I stayed in the Latin Quarter on the Rue des Boulangers. I fell in love with the neighborhood immediately and look forward to staying there again. On my last day, I toured the Institut du Monde Arabe and was mesmerized by the wonderful exhibition of Middle Eastern gardens along with the history of irrigation. Amazing! I love this area and several years in a row stayed in the same small hotel. Then they remodeled and tripled their prices and so the next years I found a cute little place in the Marsis. Still love the Museum Ian’s Luxembourg jgardens, Pantheon, little restaurants and street market each week. Love the bookstores, theSorbonne and the amazing stained glass In The church by modern artist. No memory for names. It will always be my favorite part of the city. You can sit on the curb and sketch passerby’s and feel right at home. A lovely article about my favourite part of Paris! Just one minor correction, the narrowest street in Paris is actually Sentier des Merisiers in the 12eme. Less than one meter wide in places, this fascinating passageway is lined with pretty half-timbered houses. Thank you for this fabulous article. 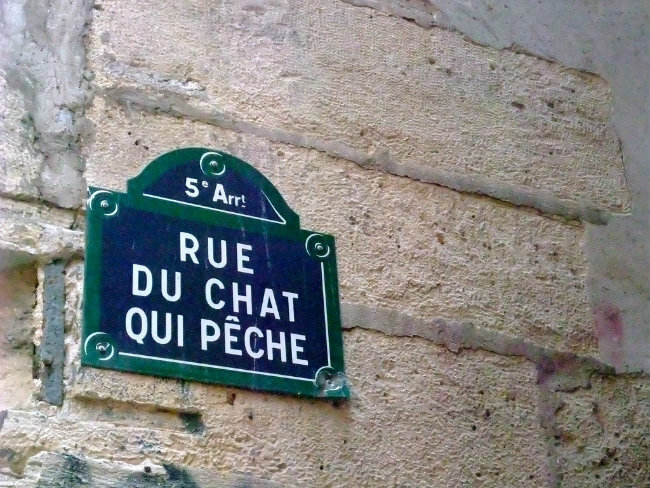 As a frequent visitor to Paris who stays in the 5eme, I can’t wait to explore some of the spots I have missed. My question is where is Sainte Genevieve Hill? Is it the Hill that leads up from Bd St. Michel up to the Pantheon? I’m so glad you enjoyed the article. The Rue de la Montaigne Sainte Genevieve, runs off Rue Monge, past the Catholic church of St Etienne du Mont and into the Place de Pantheon. 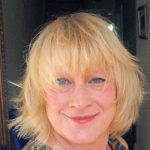 I’m sure you’ll find it on your next trip to Paris and I hope you have a wonderful time exploring the whole of the Latin Quarter. Kind regards. Ho Chi Minh may very well have worked in a Chinese restaurant in the 5th arrondissement. He lived in Paris on and off for seven years from either 1917 or 1919 and one of his addresses was in Rue Monsieur Le Prince in the 6th, bordering the Latin quarter. He had also worked as a cook on a steamship in 1911. I do hope you discover the restaurant he worked in. Fascinating stuff! Kind regards and thanks for sharing the memory. Wonderful article, Marilyn. I stay in the Fifth when I’m there – steps around the corner from the Place de la Sorbonne in your photo. – just not often enough. I’ve been lost in Paris so many times, but it’s really not a hardship, is it? Thanks Hazel, one day we’ll meet up and you can show me your Chirinquito bars and I’ll probably just get lost!